Dr Nicholas and Pablo M. Lee are en route to China to inspect a new ink that they learned about at APPPEXPO 2019 in Shanghai last month. This ink, from APOLLO ink company, is for outdoor printing yet the ink is not solvent-based and not needing UV-curing. FLAAR is working with the park administrators of Parque Nacional Yaxha Nakum Naranjo on their educational signs for part visitors, so learning about new inks is helpful. Most outdoor signs fade quickly from the sunlight. Apollo ink sample print in their booth at APPPEXPO 2019 in Shanghai. We will issue a full report on Apollo ink company and their ink when we return from China. Setting up a T-shirt company in your basement, garage, or home-office is increasingly popular. So the team at FLAAR (USA) and FLAAR Mesoamerica (Guatemala) are doing research to prepare an educational series of publications on how to get started in T-shirt printing. We will discuss differences between toner printers for T-shirts, sublimation ink T-shirt printers, and pigment ink T-shirt printers. 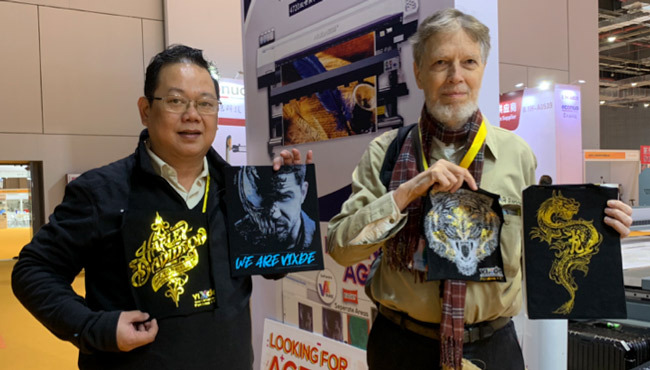 Attending APPPEXPO 2019 in Shanghai was a helpful printer trade show because more than 17 brands of T-shirt printers were on exhibit. They ranged from T-shirt printers to get started, T-shirt printers for step by step evolving to a regular T-shirt business, and T-shirt printers for serious production full-time. I would like to start with suggestions for a first-time T-shirt printer: Ricoh Ri 100 is one to look at for sure. An additional first-time T-shirt printer using toner is the new BINTERJET technology using vixde brand laser beat transfer media. What I liked about BINTERJET was the ability to add lustrous metallic-like color. As soon as we have a contact at Ricoh and access to their T-shirt printer, we will write a full report and show the results possible with a Ricoh T-shirt printer. Here is Nicholas with the developer of the lustrous ability of an updated toner printer with software and materials from BINTERJET. As soon as we have this entire BINTERJET system in our FLAAR Mesoamerica offices we will write a report. Once we have an in-house team acquire experience with T-shirt printing, we would like to work together with local people’s associations in rural areas of Peten and Alta Verapaz, Guatemala, to provide training so they can set up their own T-shirt companies to provide income for their families. Our goal will be to focus on showing the local tropical flowers, local birds, and local foxes, armadillos, agouti, etc. to encourage protecting local flora and fauna. There are two well known cenote-like openings in the karst surface of the west end of Lake Yaxha. I call these the South-West Cenote and the North-West Cenote. I spell the directions as two words deliberately: both are at the west end of the lake. One is north of the lake (about 80 meters); the other is south of the lake (about 200 meters). Both are totally filled with water (they are at the lake level; these are not like the grand cenote of Chichen Itza (where you see the water only far below)). The one cenote is between 94 and 98 feet deep, so almost 30 meters deep). I call them a cenote because the opening is the perfect size and shape of a cenote opening (I know cenotes from childhood, in the karst area of Missouri; we have a perfect Maya style cenote behind our house: about 40 to 50 feet down into the limestone, and the water is only at the bottom (flowing in and out via a cave sprint). Now I have discovered what I call a “Triple Conjoined Cenote” or “triple-conjoined circular lagoons” (if geologists determine they were not cenotes thousands of years ago). The triple-conjoined circular shape is visible on Google Maps (satellite view) and even more visible on aerial photographs of the Instituto Geografico Nacional (Guatemala). If a benefactor could provide us with a Phase One digital aerial camera, Capture One software, and powerful new computer to handle the RAW images, then we could help the institute do special coverage of the parks area of Peten (LiDAR technology removes the vegetation digitally; we need to see every single tree, every bush, in a higher resolution than any satellite system or higher than any normal government system does in these remote areas. Kit would include iX Controller MK III with Gyro Stabilized Mounts. Phase One Industrial, is a division of Phase One medium format camera company, Denmark. The triple-conjoined circular lagoons are above (north of) one of the lakes (Laguna Lankaja) to the west of the west end of Lake Yaxha. There is a bog-like aguadas-like area a few meters south of the Lake of Three Cenotes. Local people call the triple conjoined lakes Laguna Perdida. Teco (Moises Daniel Perez Diaz), a helpful park ranger, told us about a collapsed cave that takes out water from the north edge of Lake Yaxha. So there is a lot for a geologist to study here (especially for a PhD dissertation, with the geological fault overlooking the East of Nakum Savanna a major chapter. There may be a better geological word for these round areas; I am using the word cenote-like circular-shaped until I learn a better word. This is the tip top of the geological fissure (at the top of the flat hill); a few hundred meters onward, it is a steep fractured cliff, so dangerous that we did not want to get close to take a photo down into the abyss. Photo by Dr Nicholas Hellmuth using an iPhone Xs. While hiking from Nakum to discover a previously undocumented grass savanna we had to survive walking across an impressive geological fault line. The limestone hill was literally split and there was a deep ravine on one side. We hope that geologists can come here and map this fault line. 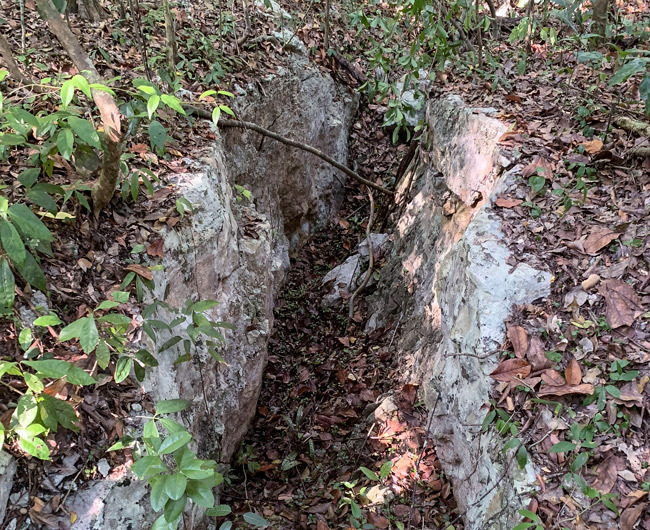 Geological fault lines we well known in Guatemala but this particular stretch is potentially never before seen and never before photographed. I have never seen anything like this in the Tikal national park (adjacent to the PNYNN). This is one more example that Parque Nacional Yaxha Nakum Naranjo offers a lot more than the monumental Mayan architecture of the several great Mayan cities within this park: now you can see the most impressive geological fault line I have ever experienced. You can see that Yaxha is associated with geological events since one entire part of one of the main plazas is sunken (in front of Stela 11, the Tlaloc warrior king stela). Our photos of the fault line east of Nakum are just snapshots of the top because our goal was to explore the unexpected and unprecedented grass savanna below. FLAAR REPORTS is a team of experienced individuals who do research and educational publications on wide-format inkjet printing techniques, equipment, and workflow. We have over 20 years experience working around the world (Japan, Taiwan, China, Dubai, Turkey, South Africa, across EU, USA, Canada, Mexico, Central America and Brazil). FLAAR REPORTS evolved from FLAAR since Nicholas has been a leader in photography of pre-Columbian civilizations since 1965 (he started photography in 1961, as a backpacker in Mexico, at Palenque). Gradually FLAAR REPORTS is evolving its own programs as FLAAR itself focuses more on endangered ecosystems, endangered animals, and the remarkable wild edible plants of the Mayan areas of Guatemala. The FLAAR REPORTS team has visited factories that develop and produce digital printers of every size, shape, and technology (including toner printers). Although we focus primarily on wide format inkjet, two of us have experience with T-shirt printers, heat presses, and all the inks and toners to print T-shirts. Because of our experience we are hired by trade shows, manufacturers, and other companies around the world (it also helps to have almost a million people who read our network of educational websites on wide-format inkjet printing). But what helps even more is that we are independent: we help printshop owners and managers, we assist distributors, and developers and manufacturers, to know more than just the good features of a project or a technology; we politely point out the weak or inadequate or aspects that should be improved. During print expos (printer and visual communication trade shows) Nicholas has print samples produced to judge edge splatter and color spectrum capability. After he checks these, he flies these print samples back to Guatemala, and drives them into the remote jungle and mountain areas to donate the prints to local schools. Last week we visited two schools in the Rio Cahabon area: both schools had FLAAR produced prints on the walls of many classrooms in each school. We thank efi, Konica Minolta, Mimaki, Handtop, Teckwin, Gongzheng, and other companies for doing sample prints 3.2m and 5m wide that we can donate to the schools in areas where Dr Nicholas works when he is not at trade shows or conferences. We also appreciate the assistance of OKI, Ricoh, and Xerox in printing samples of our MayanToons books for primary schools in Guatemala. Plus the T-shirt printer and T-shirt heat press companies for providing print samples in their booths. The FLAAR REPORTS team is heading to APPPEXPO in Shanghai since this is the largest wide-format printer expo in the world. The red “petals” are technically called bracts, or can be called leaves. The actual flower is the dozen tiny things inside the bright red area. 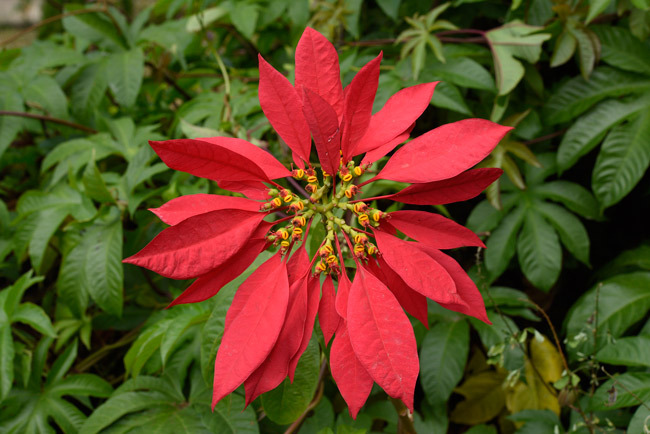 The poinsettia plants you buy in the supermarket are botanically modified from a parent stock from northern Mexico almost a century ago. 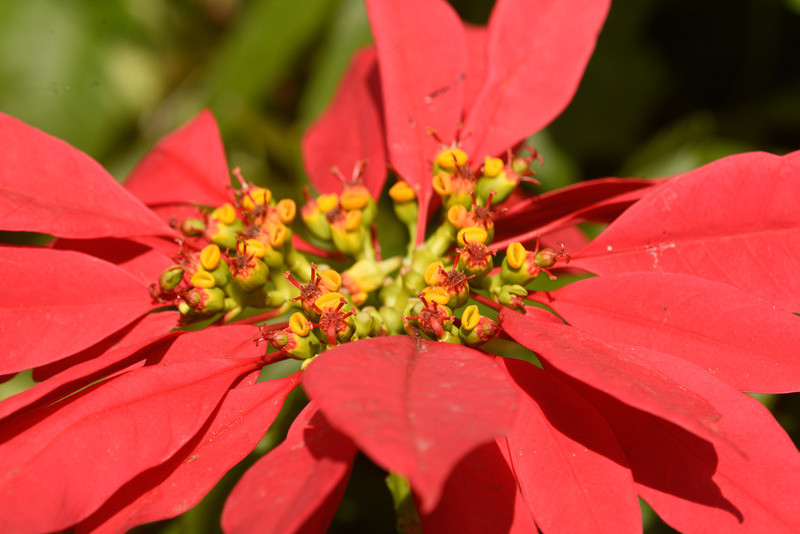 But this flower, Euphorbia pulcherrima, and its relatives are found in ravines and other areas in the Highlands of Guatemala. We have poinsettia plants growing outside all year long. And they do start blooming just before Christmas, so here are some quick snapshots from about 3 meters away from my desk. 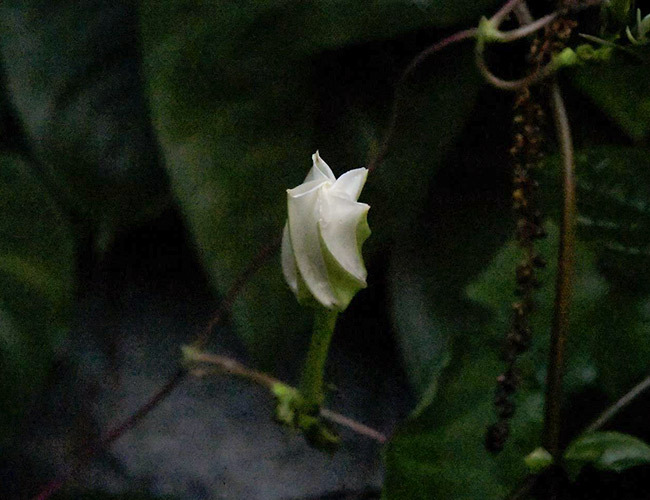 The leaves behind are a special morning glory vine whose juice can be used to vulcanize rubber by the Maya 2000 years ago. FLAAR Reports wide-format inkjet printer analysts, consultants, and research team meet to discuss the start of the 2019 digital printing season. Since our team work literally around the world, our first project is to cover the SGI 2019 expo in impressive and hospitable Dubai. Two of the team, Dr Nicholas and Pablo M. Lee will attend the Sign and Graphic Imaging Middle East 2019 event, at the Dubai World Trade Center. 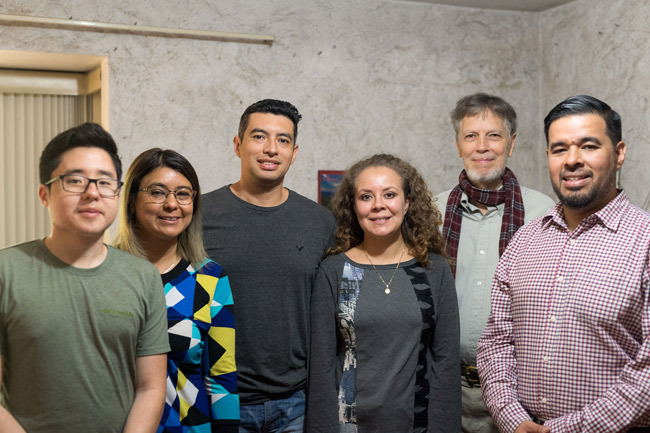 From left to right: María Reneé Ayau, Dr. Nicholas Hellmuth, Marcelo Girón, María J. García, Pablo M. Lee, Flor Setina, Paulo Nuñez and Juan C. Hernández. FLAAR has had a team at this show for over a decade because it is international, so people from all countries come here. Plus SGI is the first major printer and visual communications expo of each year. SGI is capably organized by IEC (International Expo Consults). We see their team also at other trade shows on many other continents. While at SGI 2019 we will be looking at UV-curing printers, latex printers, solvent, water-based, and textile printers, plus the inks, printable materials, laminators, cutters, and other workflow equipment. Also we will visit the booth and team of ME Printer magazine, one of the leading trade magazines for the Middle East. FLAAR is presently working with Parque Nacional Yaxha Nakum Naranjo in Peten, Guatemala on the educational signage for the Mayan temples, pyramids, palaces, ballcourts and awesome flowering plants of the surrounding rain forest. Plus Dr Nicholas has an additional team working on educational material for primary schools around this archaeological park. We hope to see you at SGI Dubai 2019, January 13, 14, and 15. Latex sap from native Mayan rubber tree (Castilla elastica) does not bounce until it is vulcanized. So the Maya game balls would not bounce until the rubber they are made from is vulcanized. The Olmec already developed vulcanization over 3000 years ago! The Maya (and all their neighbors) had several different plants (mostly vines) which produce sulfur. Simply add the juice from these vines (when squeezed), add it to latex, heat it, and your rubber is ready to bounce. We raise two of the different kinds of vines which have this sulfur content. 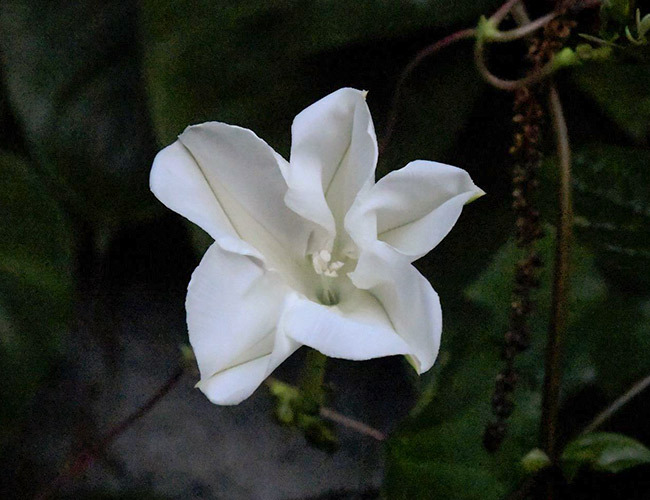 Last night the Ipomoea alba bloomed at about 6:18pm (this is why a member of the morning glory genus is called a Moonflower). Here are four different parts of the opening sequence to enjoy looking at. 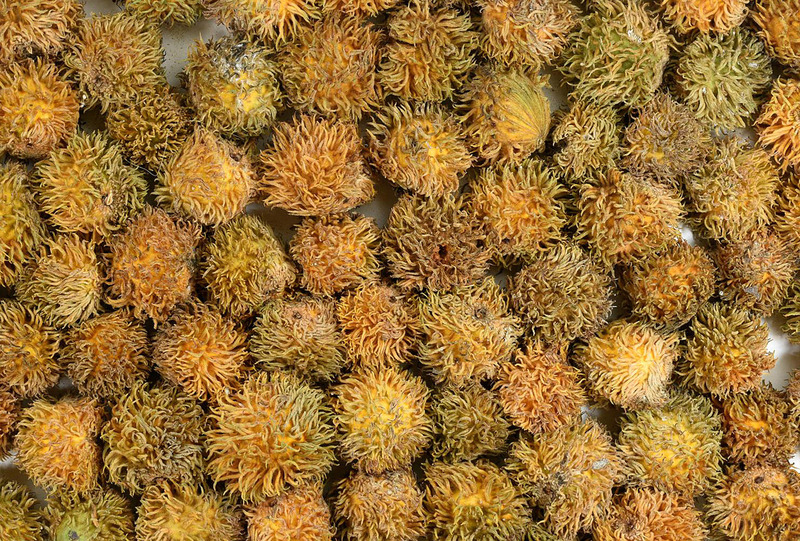 Why is this edible native fruit missing from all lists of Maya foods? LiDAR aerial photography has suggested “millions more Maya” lived in their homelands than previously estimated. What foods were available to feed all these LiDAR suggested people over 1500 years ago? Even before LiDAR began, the team of FLAAR (USA) and FLAAR Mesoamerica (Guatemala) has been working for many years on improving the 1938 list by Carnegie Institution of Washington explorer and ethnobotanist Cyrus Lundell of Plants probably utilized by the Old Empire Maya of Peten and adjacent Lowlands. Lundell’s decade of work in Campeche and Peten lists several dozen fruits; the FLAAR list by Hellmuth is over 126 fruits: all native to Mayan areas of southern Mexico, Guatemala, Belize, and Maya portions of Honduras and El Salvador. 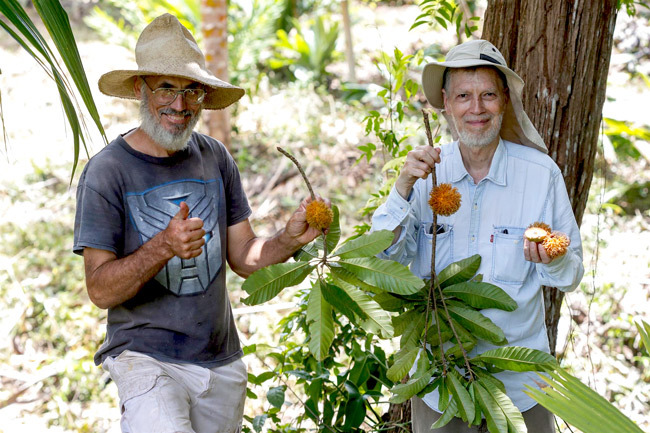 But there is one fruit missing in all recent botanical monographs on agroforestry and books on edible and medicinal plants of Belize (surely there must be a book from year 2000 onward that features this fruit, but we have not yet found it). This same fruit is missing from Lundell and we have not yet found it in any recent book on edible and medicinal plants of Peten. 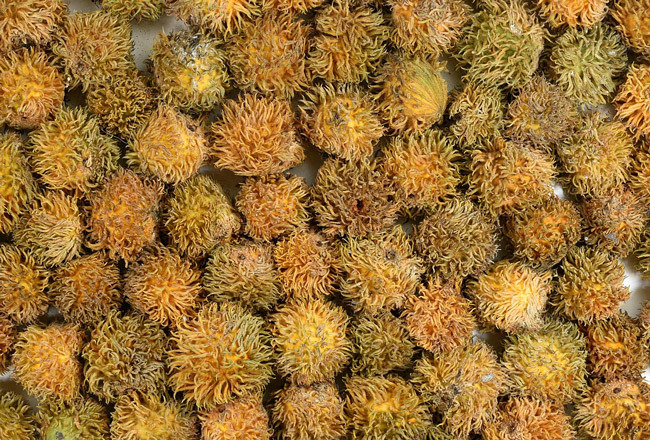 The same fruit is missing from the most recent monograph on ethnobotany of the Lacandon Maya area of Chiapas. And this fruit was missing from Hellmuth’s list also! and this tree is indeed listed as native to Mexico, Guatemala and Belize! We will be posting an entire page on this tree; and a separate FLAAR reports photo album during August. 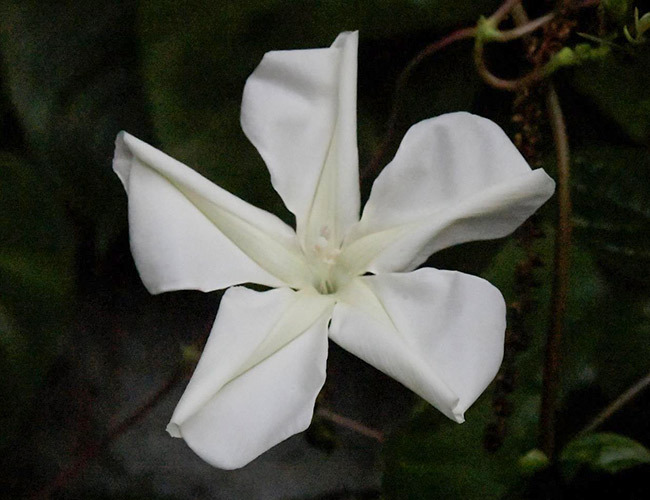 Help archaeologists by providing lists of the edible native plants available to the Maya thousands of years ago. Help improve the health of the Mayan-speaking people today (and all their neighbors) by providing lists not only of all edible plants but also their vitamins, minerals, protein and other health benefits. Help protect endangered species and fragile eco-systems. Make lists of which pollinators pollinate each edible plant and encourage saving these pollinators from extinction. Dr Hellmuth and Dwight Carter holding the fruits near the tree at Frutas del Mundo, Izabal, Guatemala. 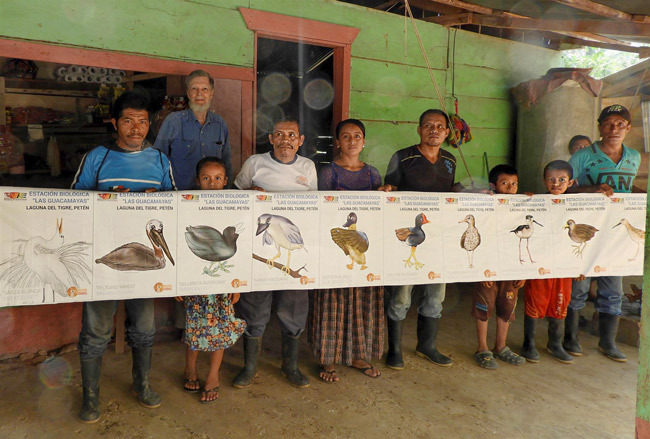 Village leaders of Aldea Cerro Azul, Municipio Chisec, Guatemala, and their families receive our donation of the first of two 5-meter long full-color printout of waterbirds of Guatemala. The school teachers can then cut each bird into a rectangular poster to put on the walls or windows of the school. All the renderings of each bird are by the illustrators of FLAAR Mesoamerica. One of our goals is to assist local people to learn about the endangered species, especially birds, mammals and pollinators. So the graphic designers and illustrators of FLAAR Mesoamerica in Guatemala prepare educational drawings of all the species of interest. We then take these drawings to printer expos and various companies that know FLAAR Reports do the printing for us. We then fly these horizontal banners back to Guatemala and drive several days to reach remote settlements. This Q’eqchi’ Mayan aldea is best reached by 4WD double-cabin pickup truck. We visited with the village leaders. They asked assistance with respect improve methods for pumping water from a cave, since the village’s previous water source went dry in past months. Before we hiked several kilometers to reach the cave spring, we showed the village leaders and their families the kinds of material we were preparing for local schools. They eagerly expressed interest in having these banners for their schools, so we donated the two banners that we happened to have. We will return to this area in the future and donate additional educational material. What would most help would be if a foundation, corporation, individual, or embassy program could print the books we have ready for primary schools (www.MayanToons.org). These books are ready in Spanish, English, and Q’eqchi’ Mayan languages. The local teachers have told us they prefer if everything can be in those three languages. FLAAR (USA) and FLAAR Mesoamerica (Guatemala) are also seeking funds to assist our project on pollinators (more than just bees, butterflies and bats). We would like to prepare banners showing all major pollinators in Guatemala, Mexico, Belize, Honduras, and El Salvador. Hall 1: CO2 laser cutters, CNC routers: an entire hall (in other words, more than at any other expo in the world (probably 100X more than at DRUPA). 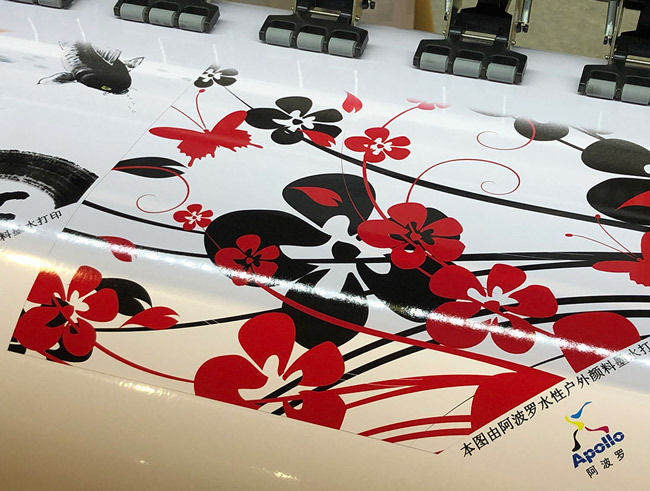 Hall 2: the Chinese Hall had more flatbed cutters; several booths FILLED with different sizes and shapes of laminators; and endless booths of wide-format and desktop-sized UV printers, solvent printers, and textile printers. Many brands are new: companies which did not exhibit in previous years. Hall 3: the International Hall: AGFA, dilli, Durst, efi VUTEk, Epson, Mimaki, Roland , and Mutoh. Lots of Chinese brands of large-format printers: JHF, Gongzheng, Handtop, Teckwin, and lots of other brands. Several brands I have never noticed before: Yameike, Yotta and more. Lots of flatbed cutters: iECHO, JWEI and more. Ink companies: Jetbest, Sam Ink, Sun Chemical (SunJet DIC), and many more. Many booths of printable materials: HEYtex, a.berger and dozens of Chinese brands. Hall 4 has miles of booths of inks and printable substrates. Hall 5 and Hall 6: signage, everything from LCD, LED to traditional signage. North Hall (at north entrance). This is now a full hall. Last year was mostly textile printers but now has everything: as filled with printers as Hall 2 and 3. What is new? This is the question we are asked the most often. Once the expo opens tomorrow, we will be visiting an ink booth which may have a remarkable new ink. Since we provide all staff flexible working hours, it is rare for 100% of the FLAAR teams to be present at any one time. But today was the birthday celebration for three different employees, so at least 90% of the teams were here at one time. You can see the Q’eqchi’ and Kakchiquel Mayan student interns and the multitude of university students who work at FLAAR. We have several teams: digital imaging printing, and flora and fauna. The flora and fauna is in two joint teams: studying plants and animals and doing storyboards and illustrations for educational comic books on endangered species of Guatemala. Our web sites on plants, animals, and how to do high res photography are read by about 600,000+ people. The digital imaging team does marketing and technology research on UV-curing printers, textile inks, textile printers and textile printing workflow, cutters, laminators, color management, RIP and other software and hardware. The FLAAR web sites on these topics are read by over half a million people around the world (different people than read the plants and animals web sites). So altogether, our entire coverage of research is read by over a million people. Ten of us, in two 4WD double-cabin pickup trucks, did a field trip deep into the remotest parts of the jungle-covered mountains of Guatemala, Central America, to test methods to render Mayan thatch-roofed houses in 3-dimensional imaging. We used a drone and drone pilot, and university students who are studying digital imaging and biology. This week, two of us are in Dubai to study wide-format inkjet printing and signage technology. We will be testing which inkjet printers and toner printers can best produce high-resolution photographs of these Mayan houses, plus which printers can best show high-resolution digital photographs of rare Neotropical flowers and jaguars. ITMA is the largest and by far best textile expo in Europe. There is nothing comparable in North America. Two of us will fly to ITMA after SGIA. If you can’t get to ITMA we will have lots of FLAAR Reports on textile printers and textile inks. If you order these reports in advance there is a 10% discount: e-mail FrontDesk “at” FLAAR.org. We attend three printer expos every year in USA: GOA (Graphics of the Americas) because it is in friendly South Miami Beach, because it is the first expo in North America of every year, and because every year we are asked to lecture both in English and in Spanish. Next we attend ISA, since this is a traditional classic for printers and signage and graphics in USA (ironically we have never attended any trade show in Canada, but unsure if one has a lecture program that we would fit into perhaps). We skip Graph Expo and “Print” because it is too small; has almost no media or substrate exhibitors, and is mostly what little remains of offset and flexo (so not enough signage and not enough wide-format inkjet). However Graph Expo is still good if you need to look at toner printers, office printing, mailing, binding, etc. and what is left of offset. Every year without fail we attend SGIA. Whereas all other USA expos have either gone downhill (Graph Expo) or not expanded dramatically at all, in distinction SGIA has grown every year. Being in crime ridden and uninspiring Atlanta (with overpriced hotels) may cause some people to think twice, but we are nonetheless sending three people (we send four to ISA since hotels are more reasonable cost in Orlando and Las Vegas). SGIA is especially good to attend for dye sublimation and textile printers. So we hope to see you there at SGIA 2016. In the 17th century Spanish colonial former capital of this part of Central America, Dr Hellmuth gave a lecture last Friday on water lily (Nymphaea alba) ethnobotany, iconography, and cosmology, based on his PhD dissertation of the 1980’s. Now, the coming Friday (Oct 30th), Nicholas will lecture on jaguars, tapirs, crocodiles, herons, sea anemones, turtles, sharks, and stingrays: creatures associated with river, lake, and ocean scenes in Mayan murals, stone sculpture, or decorated funerary vases, plates, and bowls. These lectures are organized by Fundacion La Ruta Maya. After this lecture Nicholas and two others from the wide-format inkjet printer, inks, and printable substrates division of FLAAR will fly to SGIA in USA and then two will continue to ITMA in Italy. There was so much to see at the recent Sign Istanbul that in addition to all four days of the expo, we were already taking notes the day before the expo opened (the last set-up day, when booths are still being constructed). Lots of printers of all types: UV, eco-solvent, textile, latex, and water-based, plus SUV (solvent UV, one of my favorite inks). We are now preparing our FLAAR Reports on everything that we learned, including on the co-located 3D PRINTSHOW which was in Hall 11. Last year there were more UV-cured printer brands and models at APPPEXPO than at all printer expos in Europe and North America combined. There were more brands of media and printable substrates than every other printer in the world put together. Hmmm, maybe this is why six of us will flew to Shanghai to attend this four-day expo, March 11-14. Plus there were solvent printers, water-based printers, cutters, laminators and coaters. And LED and LCD dynamic digital signage (more than every expo in USA and more than any and every signage and printer expo in all of Europe). Print shop owners and distributors, if they miss this APPPEXPO 2015, then their competitors (who attend) get a head start. www.apppexpo.com/lang/en is where you can learn more. All of us in the industry know this as APPPEXPO, but it is also called Shanghai Int'l Ad & Sign Expo, now co-located with the Shanghai Int'l Lighting Expo. Three of us from FLAAR Reports will flew to beautiful Dubai in early January to attend two co-located events: a best-signage awards event and signage conference (organized by www.enthralogy.me) and the 11, 12, 13 January SGI Dubai 2015 event (organized by IEC and shown on their www.SignMiddleEast.com). Dubai is friendly, peaceful, architecturally impressive, and worth visiting (especially if your partner likes to shop; Dubai has more and larger shopping malls than most other cities). FLAAR has been attending this expo for many years and we look forward to 2015. In addition to Dr Nicholas, two other evaluators-review editors from FLAAR will attend: Pablo Martinez (inks, media, substrates, cutters) and Maria Renee Ayau (textile inks, printers, RIP software, workflow equipment; T-shirt printers, inks, toner). If you wish to meet Dr Nicholas plus the staff, consulting opportunities are available, but please reserve in advance by writing FrontDesk "at" FLAAR.org. Over a million people around the world know the FLAAR Reports on wide-format inkjet printers, inks, media & substrates, and printer/signage expos. But we also evaluate digital cameras, on our www.digital-photography.org. At printer expos manufacturers and distributors showcase their wide-format printers, but half the time the photos they are printing are inadequate. We at FLAAR are available as photography consultants: Dr Nicholas' photos have been published by National Geographic and by Japanese coffee-table book publishers. 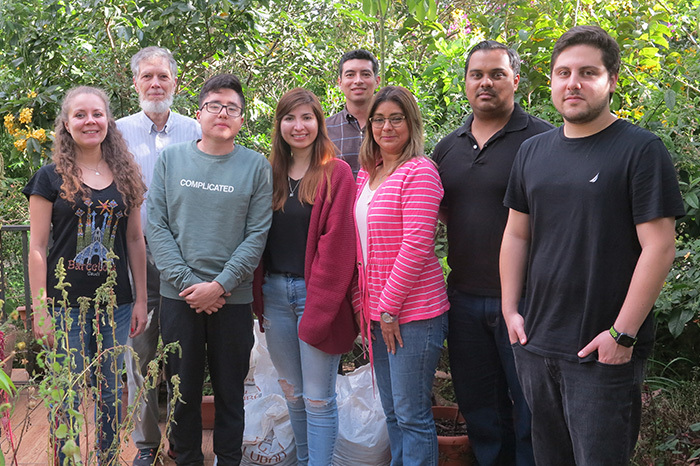 Plus there is an additional FLAAR team which studies Neotropical plants and animals of Guatemala and the rest of Mesoamerica. If you are interested in flowers or birds or jaguars, you will enjoy our www.maya-ethnozoology.org and www.maya-ethnobotany.org. We raise bees, wasps, butterflies, spiders, and tailless whip-scorpions inside or directly in front of our FLAAR headquarters building at 1500 meters above sea level in Central America. 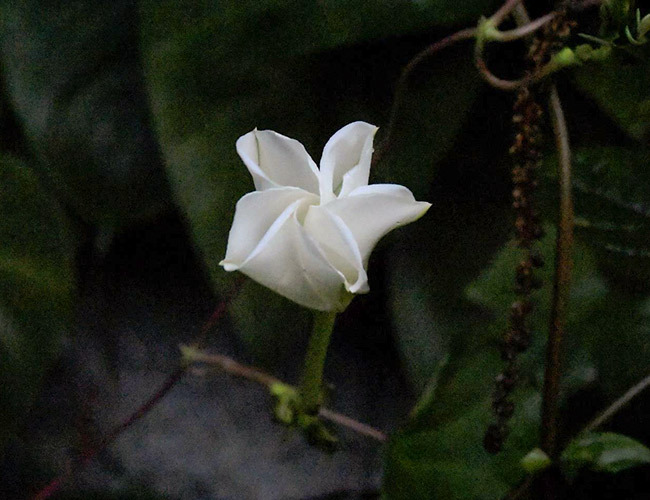 Our ethnobotanical garden around our office and inside also is a research garden on utilitarian plants of the Maya civilization. If you wish to learn about wide-format inkjet printers, the trade show which is larger than all Europe + all USA expos put together is the March 2015 expo in Shanghai. It is larger than FESPA + Serigrafia (in Brazil + all four VISCOM expos. At least six of us from FLAAR Reports, will fly to beautiful Shanghai in mid-March 2015 for this remarkable exposition. After-market inks, media, substrates, cutters, laminators, coaters, RIP software, printheads. Plus traditional signage, plus dynamic digital signage (LED and LCD monitors). Plus 3D printers (3D rapid prototypers, 3D additive manufacturing systems. We go mainly for UV-cured printers, textile printers, T-shirt printers, inks and media. But you can also find laminators, coaters, CNC routers, CO2 laser engravers and XY flatbed (digital) cutters. If you are a print shop owner, you can save enough money from after-market inks to pay the entire airplane ticket and hotel in Shanghai.